The 2D barcodes found on boarding passes encode a large amount of interesting flight and passenger data. I wrote a parser to process the output from a scan of a boarding pass barcode. Once my Flight Historian was largely complete, I began to think about future flight data I could track with it – things such as seat numbers, fare codes, or record locators. Since I didn’t yet know what I wanted to track, I realized I would need to start saving as much information about my current flights as I could to give me retroactive data. Thus, I began scanning my boarding passes (or screenshotting my electronic ones), as they seemed to be the best source of flight information I had. However, having images of boarding passes would still require a lot of manual entry in the future, and I realized that all of that information should be stored digitally. I began researching the Bar-Coded Boarding Pass (BCBP) standard. 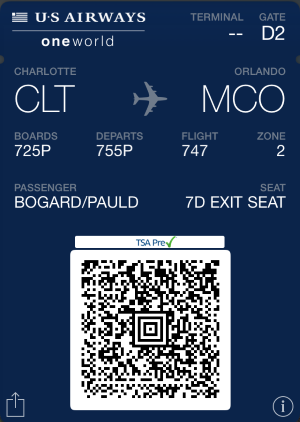 Instead of storing images of the boarding pass, I could just scan the barcode, and store it for future use in a barcode data field for each flight. Eventually, I decided that it would be helpful for me to write a class that could interpret the boarding pass data I’d been storing. Some of the data is obvious (passenger name, airport codes), but a lot of it isn’t obvious at first glance, and has to be interpreted through the BCBP standard. Additionally, though it’s rare, boarding passes can technically contain data for multiple flights for the same passenger. Thus, some data is considered repeated data (data for each specific flight, even if there is only one flight) and some data is considered unique data (data specific to the passenger or the boarding pass itself). So there are really six groups of data: three unique and three repeated. The mandatory groups are a string of consecutive fixed length fields (for example, the name field in Unique Mandatory is 20 characters, and is padded with spaces if necessary). The airline use group is a single, variable length field, again defined by a two-digit hexadecimal number encoded in the string. The security group has a few fixed-length fields, then a hexadecimal number, followed by a variable length field whose length was defined by that hexadecimal number. From there, it’s trivial to loop through the data structure to print the data and its interpretations in a tabular format.